Victor Pauca will have plenty of presents to unwrap on Christmas, but the 5-year-old resident of Winston-Salem, N.C., has already received the best gift he’ll get this year — the ability to communicate. 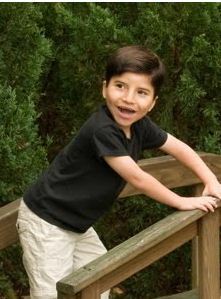 Victor has a rare genetic disorder that delays development of a number of skills, including speech. To help him and others with disabilities, his father, Paul, and some of his students at Wake Forest University in Winston-Salem have created an application for the iPhone and iPad that turns their touch screens into communication tools. The VerbalVictor app allows parents and caregivers to take pictures and record phrases to go with them. These become onscreen buttons that Victor touches when he wants to communicate. A picture of the backyard, for example, can be accompanied by a recording of a sentence like “I want to go outside and play.” When Victor touches it, his parents or teachers know what he wants to do. The app could be for sale for $10 in Apple Inc.‘s iTunes store as early as next week. The genetic disorder that Victor has, Pitt-Hopkins syndrome, has been found in only about 50 other people in the nation. The ailment causes delays in cognitive abilities, motor skills, social development and language skills. Victor’s progress, in many ways, has been good — he could walk at age 2, whereas some children with the condition can’t walk until they’re 10 or older. The Paucas tried a number of communication devices designed to help people with similar disabilities. But they were either too low-tech to be practical — one of them used paper printouts — or expensive, costing nearly $10,000. Paul Pauca, a computer science professor, decided that he and some of his students could do better. Starting in January, they worked to create an app that would use the versatility of the Apple devices to make communication easier. Because the hardware already existed, and the work was done as part of a class, there were essentially no direct costs of development. The prototype was done by late spring. “We’re not a big-budget operation, and that allows us to sell it for $10,” said Tommy Guy, one of Pauca’s students and now a PhD candidate at the University of Toronto. Jim Tobias, president of consulting firm Inclusive Technologies and an expert on disability-accessible technology, points out that VerbalVictor takes advantage of general-purpose, mass-market gadgets that cost hundreds of dollars rather than thousands. People who already own an iPhone or iPad need to pay only $10 more for the app, “instead of taking a risk with $1,000” with specialized machines, said Tobias, who is not involved with the project.